Karl Dönitz (sometimes spelled Doenitz German: [ˈdøːnɪts] ( listen); 16 September 1891 – 24 December 1980) was a German admiral who played a major role in the naval history of World War II. Dönitz briefly succeeded Adolf Hitler as the head of state of Nazi Germany. On 27 September 1913, Dönitz was commissioned as a Leutnant zur See (acting sub-lieutenant). When World War I began, he served on the light cruiser SMS Breslau in the Mediterranean Sea. In August 1914, the Breslau and the battlecruiser SMS Goeben were sold to the Ottoman navy; the ships were renamed the Midilli and the Yavuz Sultan Selim, respectively. They began operating out of Constantinople, under Rear Admiral Wilhelm Souchon, engaging Russian forces in the Black Sea. On 22 March 1916, Dönitz was promoted to Oberleutnant zur See. When the Midilli put into dock for repairs, he was temporarily assigned as airfield commander at the Dardanelles. From there, he requested a transfer to the submarine forces, which became effective in October 1916. He served as watch officer on U-39, and from February 1917 onward as commander of UC-25. On 2 July 1918, he became commander of UB-68, operating in the Mediterranean. On 4 October, after suffering technical difficulties, this boat was sunk by the British and Dönitz was imprisoned on Malta. He realized convoys introduced in 1917 had stopped the U-boats from becoming a decisive factor. However, he had learned that convoys could be attacked successfully at night by several U-boats. The war ended in 1918, but Dönitz remained in a British camp near Sheffield as a prisoner of war until returning to Germany in July 1920. He continued his naval career in the naval arm of the Weimar Republic's armed forces. On 10 January 1921, he became a Kapitänleutnant (lieutenant) in the new German navy (Vorläufige Reichsmarine). Dönitz commanded torpedo boats, becoming a Korvettenkapitän (lieutenant-commander) on 1 November 1928. On 1 September 1933, he became a Fregattenkapitän (commander) and, in 1934, was put in command of the cruiser Emden, the ship on which cadets and midshipmen took a year-long world cruise as training. At the time, many – including Admiral Raeder, – felt that such talk marked Dönitz as a weakling. 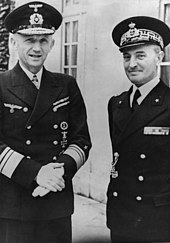 Dönitz was alone among senior naval officers, including some former submariners, in believing in a new submarine war on trade. 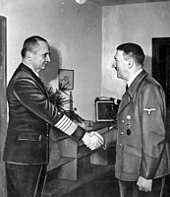 Dönitz and Raeder argued that constantly over-funding priorities within the Navy, while at the same time competing for funds with Hitler's friends, such as Hermann Göring, who received greater attention at this time. Dönitz, in contrast, began intensely training his crews in the new tactics. The marked inferiority of the German surface fleet left submarine warfare as Germany's primary naval option once war broke out. In September 1939, Germany invaded Poland. Britain and France declared war on Germany, and World War II began. The Kriegsmarine was unprepared, not expecting war before 1945. The Z Plan was tailored for this assumption, calling for a balanced fleet with a greatly increased number of surface capital ships, including several aircraft carriers. It was suspended and U-boat construction given priority. When the war began, Dönitz had 46 U-boats ready for action but only 22 oceangoing Type VIIs. He made do with what he had, while being harassed by Raeder and with Hitler calling on him to dedicate boats to military actions against the British fleet directly. These operations had mixed success; the aircraft carrier HMS Courageous and battleship Royal Oak were sunk, battleships HMS Nelson damaged and Barham sunk at a cost of some U-boats, diminishing the small quantity available even further. Mines were also employed. On 1 October 1939, Dönitz became a Konteradmiral (rear admiral) and "Commander of the Submarines" (Befehlshaber der Unterseeboote, BdU); on 1 September the following year, he was made a Vizeadmiral (vice admiral). From 3 September 1939 to 28 February 1940 the U-boats sank 199 ships. Dönitz was deeply involved in the daily operations of his boats, often contacting them up to 70 times a day with questions about as their position, fuel supply, and other "minutiae". This incessant questioning compromised his ciphers by giving the Allies more messages to work with. Furthermore, replies from the boats enabled the Allies to use direction finding (HF/DF, called "Huff-Duff") to locate a U-boat using its radio, track it and attack it (often with aircraft able to sink it with impunity). The major German naval operation of the war was the invasion of Norway in April 1940. U-boats launched four attacks on a battleship, fourteen on a cruiser, ten on a destroyer, and ten on transports, but owing to misses or to torpedoes that failed to explode, only one transport was sunk. Dönitz visited his U-boats to assure the crews that they soon would have effective weapons and sent them to sea as mine-layers while torpedoes were improved. His opposition to the larger Type IX was not unique; Admiral Thomas C. Hart, commander of the United States Asiatic Fleet in the Philippines at the outbreak of the Pacific War, unsuccessfully opposed fleet boats like the Gato and Balao classes as "too luxurious". From mid-April 1945, Dönitz and elements of what remained of the Reich government moved into the buildings of the Stadtheide Barracks in Plön. In his last will and testament, dated 29 April 1945, Hitler named Dönitz his successor as Staatsoberhaupt (Head of State), with the titles of Reichspräsident (President) and Supreme Commander of the Armed Forces. The same document named Propaganda Minister Joseph Goebbels as Head of Government with the title of Reichskanzler (Chancellor). Furthermore, Hitler declared both Göring and Himmler traitors and expelled them from the party. On 1 May, the day after Hitler's own suicide, Goebbels committed suicide. Dönitz thus became the sole representative of the crumbling German Reich. He appointed Finance Minister Count Ludwig Schwerin von Krosigk as "Leading Minister" (Krosigk had declined to accept the title of Chancellor), and they attempted to form a government. On 1 May, Dönitz announced that Hitler had fallen and had appointed him as his successor. On 2 May, the new government of the Reich fled to Flensburg-Mürwik before the approaching British troops. That night, Dönitz made a nationwide radio address in which he announced Hitler's death and said the war would continue in the East "to save Germany from destruction by the advancing Bolshevik enemy". However, Dönitz knew that Germany's position was untenable and the Wehrmacht was no longer capable of offering meaningful resistance. During his brief period in office, he devoted most of his effort to ensuring the loyalty of the German armed forces and trying to ensure German troops would surrender to the British or Americans and not the Soviets. He feared vengeful Soviet reprisals, and hoped to strike a deal with the Western Allies. In the end, Dönitz's tactics were moderately successful, enabling about 1.8 million German soldiers to escape Soviet capture. His authority was effectively limited to a narrow band of territory running from the Austrian border through Berlin to the Danish border, and even that had been cut in two by the American advance to join with Soviet forces at Torgau on the Elbe. These considerations (the bare survival of the German people), which all pointed to the need for the creation of some sort of central government, took shape and form when I was joined by Graf Schwerin-Krosigk. In addition to discharging his duties as Foreign Minister and Minister of Finance, he formed the temporary government we needed and presided over the activities of its cabinet. Though restricted in his choice to men in northern Germany, he nonetheless succeeded in forming a workmanlike cabinet of experts. The picture of the military situation as a whole showed clearly that the war was lost. As there was also no possibility of effecting any improvement in Germany's overall position by political means, the only conclusion to which I, as head of state, could come was that the war must be brought to an end as quickly as possible in order to prevent further bloodshed. I handed Himmler the telegram containing my appointment. "Please read this," I said. I watched him closely. As he read, an expression of astonishment, indeed of consternation, spread over his face. All hope seemed to collapse within him. He went very pale. Finally he stood up and bowed. "Allow me," he said, "to become the second man in your state." I replied that was out of the question and that there was no way I could make any use of his services. Thus advised, he left me at about one o'clock in the morning. The showdown had taken place without force, and I felt relieved. On 4 May, Admiral Hans-Georg von Friedeburg, representing Dönitz, surrendered all German forces in the Netherlands, Denmark, and northwestern Germany under Dönitz's command to Field Marshal Sir Bernard Law Montgomery at Lüneburg Heath just southeast of Hamburg, signalling the end of World War II in northwestern Europe. A day later, Dönitz sent Friedeburg to US General Dwight D. Eisenhower's headquarters in Rheims, France, to negotiate a surrender to the Allies. The Chief of Staff of OKW, Generaloberst (Colonel-General) Alfred Jodl, arrived a day later. Dönitz had instructed them to draw out the negotiations for as long as possible so that German troops and refugees could surrender to the Western powers, but when Eisenhower let it be known he would not tolerate their stalling, Dönitz authorised Jodl to sign the instrument of unconditional surrender at 1:30 on the morning of 7 May. Just over an hour later, Jodl signed the documents. The surrender documents included the phrase, "All forces under German control to cease active operations at 23:01 hours Central European Time on 8 May 1945." At Stalin's insistence, on 8 May, shortly before midnight, (Generalfeldmarschall) Wilhelm Keitel repeated the signing in Berlin at Marshal Georgiy Zhukov's headquarters, with General Carl Spaatz of the USAAF present as Eisenhower's representative. At the time specified, World War II in Europe ended. On 23 May, the Dönitz government was dissolved when Dönitz was arrested by an RAF Regiment task force under the command of Squadron Leader Mark Hobden. The Großadmiral's Kriegsmarine flag, which was removed from his headquarters, can be seen at the RAF Regiment Heritage Centre at RAF Honington. 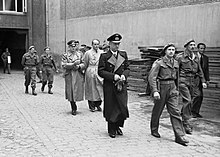 Generaloberst Jodl, Reichsminister Speer and other members were also handed over to troops of the King's Shropshire Light Infantry at Flensburg. His ceremonial baton, awarded to him by Hitler, can be seen in the regimental museum of the KSLI in Shrewsbury Castle. Despite his postwar claims, Dönitz was seen as supportive of Nazism during the war. Several naval officers described him as "closely tied to Hitler and Nazi ideology." On one occasion, he spoke of Hitler's humanity. Another event, in which he spoke to Hitler Youth in what was defined as an "inappropriate way," earned him the nickname of "Hitler Youth Dönitz." He refused to help Albert Speer stop the scorched earth policy dictated by Hitler and is also noted to have declared, "In comparison to Hitler we are all pipsqueaks. Anyone who believes he can do better than the Führer is stupid." Several anti-Semitic statements by Dönitz are known. When Sweden closed its international waters to Germany, he blamed this action on their fear and dependence on "international Jewish capital." In August 1944, he declared, "I would rather eat dirt than see my grandchildren grow up in the filthy, poisonous atmosphere of Jewry." On German Heroes' Day (12 March) of 1944, Dönitz declared that, without Adolf Hitler, Germany would be beset by "the poison of Jewry," and the country destroyed for lack of National Socialism which, as Dönitz declared, met an uncompromising ideology with defiance. [Note 3] At the Nuremberg trials, Dönitz claimed the statement about the "poison of Jewry" was regarding "the endurance, the power to endure, of the people, as it was composed, could be better preserved than if there were Jewish elements in the nation." Initially he claimed, "I could imagine that it would be very difficult for the population in the towns to hold out under the strain of heavy bombing attacks if such an influence were allowed to work." Dönitz told Leon Goldensohn, an American psychiatrist at Nuremberg, "I never had any idea of the goings-on as far as Jews were concerned. Hitler said each man should take care of his business and mine was U-boats and the Navy." Dönitz also told Goldensohn of his support for Admiral Bernhard Rogge, who had one Jewish grandparent, when the Nazis began to persecute him. Following the war, Dönitz was held as a prisoner of war by the Allies. He was indicted as a major war criminal at the Nuremberg Trials on three counts. One: conspiracy to commit crimes against peace, war crimes, and crimes against humanity. Two: planning, initiating, and waging wars of aggression. Three: crimes against the laws of war. Dönitz was found not guilty on count one of the indictment, but guilty on counts two and three. For nearly seven decades, Dönitz was the only head of state to be convicted by an international tribunal until the conviction of Liberia's Charles Taylor in April 2012. During the trial, army psychologist Gustave Gilbert was allowed to examine Nazi leaders on trial for war crimes. Among other tests, a German version of the Wechsler–Bellevue IQ test was administered. Dönitz and Hermann Göring scored 138, which made them equally the third-highest among the Nazi leaders tested. 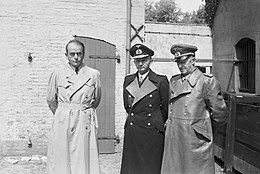 Dönitz disputed the propriety of his trial at Nuremberg, commenting on count two: "At Nuremberg I was found guilty because among other things I 'during the course of the war had had one hundred and twenty conferences with Hitler on questions concerning the Navy'. How in heaven's name could a commander-in-chief of a service responsible directly to the Head of the State, have fulfilled his duties in any other way?" Over 100 senior Allied officers also sent letters to Dönitz conveying their disappointment over the fairness and verdict of his trial. At the trial, Dönitz was charged with waging unrestricted submarine warfare against neutral shipping. Permitting Hitler's Commando Order of 18 October 1942 to remain in full force when he became commander-in-chief of the Navy, and to that extent responsibility for that crime. His defence was that the order excluded men captured in naval warfare, and that the order had not been acted upon by any men under his command. Added to that was his knowledge of 12,000 involuntary foreign workers working in the shipyards, and doing nothing to stop it. In 1945, Hitler asked Dönitz whether the Geneva Convention should be denounced. Hitler's motives were twofold. The first was that reprisals could be taken against Western Allied prisoners of war; second, it would deter German forces from surrendering to the Western Allies, as was happening on the Eastern Front where the convention was in abeyance. Instead of arguing the conventions should never be denounced, Dönitz suggested it was not expedient to do so, so the court found against him on this issue; but as the convention was not denounced by Germany, and British prisoners in camps under Dönitz's jurisdiction were treated strictly according to the Convention, the Court considered these mitigating circumstances. Among the war-crimes charges, Dönitz was accused of waging unrestricted submarine warfare for issuing War Order No. 154 in 1939, and another similar order after the Laconia incident in 1942, not to rescue survivors from ships attacked by submarine. By issuing these two orders, he was found guilty of causing Germany to be in breach of the Second London Naval Treaty of 1936. However, as evidence of similar conduct by the Allies was presented at his trial, and with the help of his lawyer, Otto Kranzbühler, his sentence was not assessed on the grounds of this breach of international law. 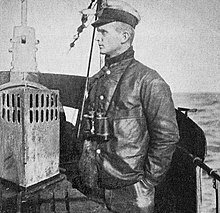 On the specific war crimes charge of ordering unrestricted submarine warfare, Dönitz was found "[not] guilty for his conduct of submarine warfare against British armed merchant ships", because they were often armed and equipped with radios which they used to notify the admiralty of attack. [Note 4] As stated by the judges: "Dönitz is charged with waging unrestricted submarine warfare contrary to the Naval Protocol of 1936 to which Germany acceded, and which reaffirmed the rules of submarine warfare laid down in the London Naval Agreement of 1930 ... The order of Dönitz to sink neutral ships without warning when found within these zones was, therefore, in the opinion of the Tribunal, violation of the Protocol ... The orders, then, prove Dönitz is guilty of a violation of the Protocol ... The sentence of Dönitz is not assessed on the ground of his breaches of the international law of submarine warfare." His sentence on unrestricted submarine warfare was not assessed, because of similar actions by the Allies. In particular, the British Admiralty, on 8 May 1940, had ordered all vessels in the Skagerrak sunk on sight, and Admiral Chester Nimitz, wartime commander-in-chief of the US Pacific Fleet, stated the US Navy had waged unrestricted submarine warfare in the Pacific from the day the US officially entered the war. Thus, Dönitz was found guilty of waging unrestricted submarine warfare against unarmed neutral shipping by ordering all ships in designated areas in international waters to be sunk without warning. No additional prison time was added to his sentence for this crime. Dönitz was imprisoned for 10 years in Spandau Prison in what was then West Berlin. Dönitz was released on 1 October 1956 and retired to the small village of Aumühle in Schleswig-Holstein in northern West Germany. There, he worked on two books. His memoirs, Zehn Jahre, Zwanzig Tage (Memoirs: Ten Years and Twenty Days), were released in Germany in 1958 and became available in an English translation the following year. This book recounted Dönitz's experiences as U-boat commander (10 years) and President of Germany (20 days). In it, Dönitz explains the Nazi regime as a product of its time, but argues he was not a politician and thus not morally responsible for many of the regime's crimes. He likewise criticizes dictatorship as a fundamentally flawed form of government and blames it for many of the Nazi era's failings. Dönitz's second book, Mein wechselvolles Leben (My Ever-Changing Life) is less known, perhaps because it deals with the events of his life before 1934. This book was first published in 1968, and a new edition was released in 1998 with the revised title Mein soldatisches Leben (My Martial Life). In 1973, he appeared in the Thames Television production The World at War, in one of his few television appearances. Dönitz was unrepentant regarding his role in World War II, saying that he had acted at all times out of duty to his nation. He lived out the rest of his life in relative obscurity in Aumühle, occasionally corresponding with collectors of German naval history, and died there of a heart attack on 24 December 1980. As the last German officer with the rank of Großadmiral (grand admiral), he was honoured by many former servicemen and foreign naval officers who came to pay their respects at his funeral on 6 January 1981. He was buried in Waldfriedhof Cemetery in Aumühle without military honours, and service members were not allowed to wear uniforms to the funeral. Also in attendance were over 100 holders of the Knight's Cross of the Iron Cross. On 27 May 1916, Dönitz married a nurse named Ingeborg Weber (1894–1962), the daughter of German general Erich Weber (1860–1933). They had three children whom they raised as Protestant Christians: daughter Ursula (1917–1990) and sons Klaus (1920–1944) and Peter (1922–1943). In 1937, Karl Dönitz's daughter Ursula married U-boat commander Günther Hessler. Both of Dönitz's sons were killed during the Second World War. The younger, Peter, was killed on 19 May 1943, when U-954 was sunk in the North Atlantic with all hands. After this loss, the elder son, Klaus, was allowed to leave combat duty and began studying to be a naval doctor. Klaus was killed on 13 May 1944 while taking part in an action contrary to standing orders prohibiting his involvement in any combat role. He persuaded his friends to let him go on the torpedo boat S-141 for a raid on Selsey on his 24th birthday. The boat was sunk by the French destroyer La Combattante and Klaus died, though six others were rescued. This article incorporates information from the equivalent articles on the Italian Wikipedia and the German Wikipedia. ^ Commonly known as Drumbeat, it has connotations of "tattoo" or "thunderbolt" in German. ^ Grier 2007, p. 256, Footnote 8, Chapter 10. ^ Hamilton 1996, pp. 285, 286. ^ a b c d e f g h i j Steinweis, Rogers & Grier 2003, pp. 186–188. ^ a b c d e f g h Judgement: Dönitz the Avalon Project at the Yale Law School. ^ a b Simons, Marlise (26 April 2012). "Charles Taylor, Liberia's Ex-Leader, Is Convicted". New York Times. Retrieved 6 September 2018. ^ a b Zabecki 2014, p. 354. ^ Helgason, Guðmundur. "WWI U-boats: UB 68". German and Austrian U-boats of World War I - Kaiserliche Marine - Uboat.net. Retrieved 30 August 2009. ^ Dönitz 1997, p. 7. ^ Dönitz 1997, p. 43. ^ Otto Kretschmer preferred to fight surfaced for exactly that reason. Robertson, Terrence. The Golden Horseshoes. (London, Pan, 1957). ^ Dönitz 1997, pp. 37–38. ^ Dönitz 1997, p. 41. ^ Roskill, S. W. (1976). The war at sea, 1939-1945 / by S.W. Roskill. 1. London: H. M. S. O. p. 615. ^ Dönitz 1997, p. 85. ^ "Pignerolle dans la Seconde Guerre mondiale". ^ Dönitz 1997, p. 137. ^ Ministry of Defence (Navy) (1989). The U-boat war in the Atlantic. London: H. M. S. O. p. vii. ^ Dönitz 1997, p. 219. ^ Dönitz 1997, p. 233. ^ "Military History Online". Military History Online. 15 December 2002. Retrieved 12 July 2013. ^ von der Porten., Edward P. (1970). The German Navy in World War II. London: Baker. ^ Dönitz 1997, p. 266. ^ Helgason, Guðmundur. "Eberhard Godt". German U-boats of WWII - uboat.net. Retrieved 16 August 2009. ^ Dönitz 1997, pp. 398–400. ^ Dönitz 1997, p. 424. ^ Kershaw 2008, pp. 943–946. ^ Steinweis, Rogers & Grier 2003, p. 182. ^ a b Shirer 1983. ^ Beevor 2002, pp. 380–381. ^ Kershaw 2008, p. 962. ^ Dollinger 1997, p. 242. ^ Oliver, Kingsley M. The RAF Regiment at War 1942–1946. Great Britain 2002: Pen & Sword. p. 118. ^ Zillmer 1995, p. 141. ^ Blair 1998, pp. 704–705. ^ Ronzitti 1988, p. 359. 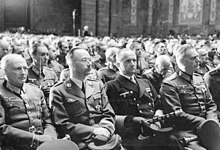 ^ "Dönitz case for the defence at Nuremberg trials". Tercer-reich.com. 27 February 2011. Retrieved 12 July 2013. ^ Cowley & Parker 2005, p. 139. ^ iPad iPhone Android TIME TV Populist The Page (24 September 1956). "The Lion Is Out – TIME". Time.com. Retrieved 12 July 2013. ^ DAMON STETSON (26 December 1980). "Doenitz Dies; Gave Up for Nazis :Admiral Doenitz Is Dead; Surrendered for the Nazis". New York Times. ^ Times, John Vinocur, Special To The New York (7 January 1981). "WAR VETERANS COME TO BURY, AND TO PRAISE, DOENITZ" – via NYTimes.com. ^ Miller 2000, p. 145. ^ a b c d e f g Busch & Röll 2003, p. 26. ^ a b c d Busch & Röll 2003, p. 27. ^ a b c d e f g h i j k l m Busch & Röll 2003, p. 28. ^ a b Thomas 1997, p. 123. ^ a b Scherzer 2007, p. 275. ^ Fellgiebel 2000, p. 162. ^ "Karl Dönitz (Character)". IMDb.com. Retrieved 20 May 2008. Blair, Clay (1998). Hitler's U-boat War: Vol. II, The Hunted, 1942–1945. Random House. ISBN 978-0-679-45742-8. Cowley, Robert; Parker, Geoffrey (2005). The Reader's Companion to Military History. Houghton Mifflin Harcourt. ISBN 978-0-547-56146-2. Dollinger, Hans (1997). The Decline and Fall of Nazi Germany and Imperial Japan, Library of Congress Catalogue Card # 67-27047. London: Bounty Books. ISBN 978-0-7537-0009-9. Goldensohn, Leon (2004). The Nuremberg Interviews. New York. ISBN 1-4000-3043-9. Grier, Howard D. (2007). Hitler, Dönitz, and the Baltic Sea. The Third Reich's last hope. Naval Institute Press. ISBN 1-59114-345-4. Helgason, Guðmundur. "Befehlshaber der Unterseeboote (BdU) Karl Dönitz". German U-boats of WWII - uboat.net. Hamilton, Charles (1996). Leaders & Personalities of the Third Reich, Vol. 2. San José, CA: R. James Bender Publishing. ISBN 978-0-912138-66-4. Mosley, Leonard (1974). The Reich Marshal: A Biography of Hermann Goering. Garden City: Doubleday. ISBN 978-0-385-04961-0. Miller, David (2000). U-Boats: The Illustrated History of the Raiders of the Deep. Washington, D.C.: Brassey's. ISBN 978-1-57488-246-9. Ronzitti, Natalino (1988). The Law of Naval Warfare: A Collection of Agreements and Documents with Commentaries. Martinus Nijhoff. ISBN 90-247-3652-8. Shirer, William (1983). The Rise and Fall of the Third Reich. New York: Fawcett Crest. ISBN 0-449-21977-1. Steinweis, Alan E.; Rogers, Daniel E.; Grier, David (2003). The Impact of Nazism: New Perspectives on the Third Reich and its Legacy. Harris Center for Judaic Studies. ISBN 0-8032-4299-9. Zabecki, David T. (2014). Germany at War: 400 Years of Military History [4 volumes]: 400 Years of Military History. ABC-CLIO. ISBN 978-1598849813. Zillmer, Eric A. (1995). The Quest for the Nazi Personality: a Psychological Investigation of Nazi War Criminals. Lawrence Erlbaum Associates. Hillsdale NJ: Lawrence Erlbaum Associates. ISBN 978-0-8058-1898-7. Cremer, Peter. U-Boat Commander: A Periscope View of the Battle of the Atlantic. 1984. ISBN 0-87021-969-3. Hadley, Michael L. U-Boats Against Canada: German Submarines in Canadian Waters. McGill-Queen's University Press: 1985. ISBN 0-7735-0801-5. Thompson, H.K. & Henry Strutz. Doenitz at Nuremberg, a reappraisal: War crimes and the military professional. Amber Pub. Corp. 1976. Turner, Barry (2016). Karl Doenitz and the Last Days of the Third Reich. London: Icon Books. ISBN 978-1-7857-805-47. This page is based on the Wikipedia article Karl Dönitz; it is used under the Creative Commons Attribution-ShareAlike 3.0 Unported License (CC-BY-SA). You may redistribute it, verbatim or modified, providing that you comply with the terms of the CC-BY-SA.